What's a Good Academic Record? What's a Good Advanced Placement Test Score? What Counts as an Extracurricular Activity? With the lure of high salaries and strong job prospects, many students enter college thinking they will major in engineering. The actual math and science demands of the field, however, quickly drive some students away. 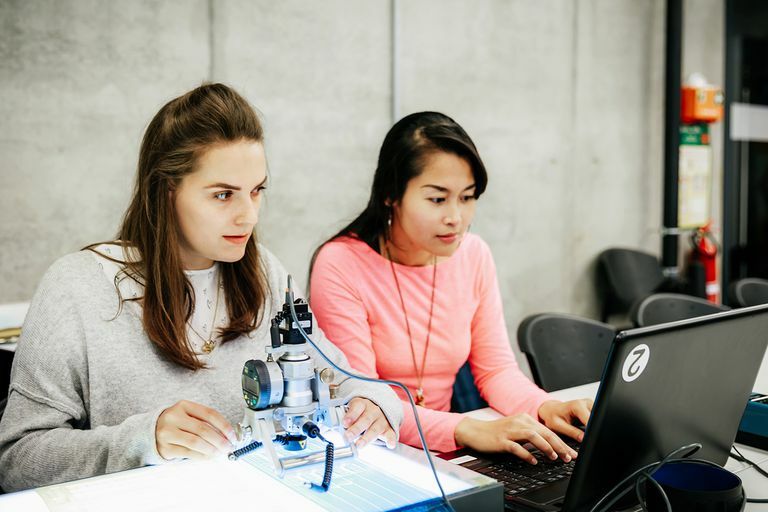 If you think engineering might be a good choice for you, a summer engineering program is a stellar way to learn more about the field and expand your experiences. This introductory engineering course for high school juniors and seniors is offered by Johns Hopkins University at several locations across the country. Engineering Innovation teaches critical thinking and applied problem-solving skills for future engineers through lectures, research, and projects. If the student achieves an A or B in the program, she will also receive three transferable credits from the university. The program runs for four or five days a week over four to five weeks, depending on the location. Eligible students applying to one of the commuter program locations may apply for need-based financial assistance. Most locations offer commuter programs only, but the Johns Hopkins Homewood campus in Baltimore and Hood College in Frederick, Maryland, both offer residential options. The Massachusetts Institute of Technology offers this enrichment program for high school seniors interested in engineering, science, and entrepreneurship. Students select five of 14 rigorous academic courses to study over the six-week residential program. MITES offers opportunities for students to network with a diverse group of individuals within the fields of science and engineering. Students also share and celebrate their own cultures. MITES is scholarship based, with all coursework, room, and board provided. Students selected for the program need only provide their own transportation to and from the MIT campus in Cambridge, Massachusetts. Hosted by the University of Michigan’s Society of Women Engineers, the Summer Engineering Exploration Camp is a one-week residential program for high school sophomores, juniors, and seniors interested in engineering. Participants have the opportunity to explore several different areas of engineering during workplace tours, group projects, and presentations by students, faculty, and professional engineers. Campers also enjoy recreational events, exploring the town of Ann Arbor and experiencing a university residential atmosphere in the University of Michigan dorms. Scholarships are available to students with financial need. The Summer Academy for Mathematics and Science (SAMS) is a rigorous summer program for high school juniors and seniors with a strong interest in math and science who may be considering a career in engineering. With separate tracks for each grade level, the academy offers a combination of traditional lecture-style instruction and hands-on projects that apply engineering concepts. SAMS runs for six weeks, and participants stay in residence halls on the Carnegie Mellon campus in Pittsburgh, Pennsylvania. The program does not charge tuition, housing, or dining fees. Students who are admitted to the program are only responsible for textbook fees, transportation, and recreational expenses. This residential summer engineering camp for high school juniors and seniors is offered by the Worldwide Youth in Science and Engineering program, headquartered at the University of Illinois at Urbana-Champaign. ﻿Campers have the chance to interact with engineering students and faculty, visit engineering facilities and research labs at the university, and work together on hands-on engineering projects. During the program, students also participate in traditional camp recreational and social activities. Applicants to the program are required to complete a 500-word statement-of-purpose essay and provide the contact information for a teacher recommender. The camp runs for two one-week sessions each summer. The University of Maryland offers a number of summer programs to high school students for exploring various disciplines of engineering. The Discovering Engineering program for high school juniors and seniors is a residential one-week immersion in the university’s engineering program. Discovering Engineering includes tours, lectures, laboratory work, demonstrations, and team projects designed to help students develop their math, science, and engineering skills and decide if engineering is right for them. The university also offers Engineering Science and Technology to Energize and Expand Young Minds (ESTEEM), a four-week commuter program for high school seniors that explores engineering research methodology through lectures, demonstrations, and workshops. Applicants to both programs are required to submit an essay explaining why they would like to participate in their selected program. All programs are held on the University of Maryland campus in College Park. The University of Notre Dame’s Introduction to Engineering program offers high school seniors with strong academic backgrounds and an interest in engineering the opportunity to further explore potential career paths in engineering. During the two-week program, students can experience a taste of college life, staying in Notre Dame campus housing while attending lectures with Notre Dame faculty members. ﻿Students may study aerospace, mechanical, civil, computer, electrical, and chemical engineering in addition to participating in hands-on laboratory activities, field trips, and engineering design projects. Upon acceptance to the program, students may apply for a limited number of partial scholarships. The University of Pennsylvania offers motivated high school sophomores, juniors, and seniors the opportunity to explore engineering at the college level during its three-week residential Engineering Summer Academy at Penn (ESAP). This intensive program includes lecture and laboratory courses in biotechnology, computer graphics, computer science, nanotechnology, robotics, and engineering complex networks. All courses are taught by Penn faculty and other distinguished scholars in the field. ESAP also includes extracurricular workshops and discussions on topics such as SAT preparation, college writing, and the college admissions process. Applicants to the program are required to complete a personal essay and provide two letters of recommendation. The University of California San Diego branch of the California State Summer School for Mathematics and Science (COSMOS) emphasizes technology and engineering in its summer course offerings for high school students. Students enrolled in this rigorous four-week residential program choose one of nine academic subjects or "clusters" from topics such as tissue engineering and regenerative medicine, biodiesel from renewable sources, earthquake engineering, and music technology. ﻿Students also take a course on science communication to help them prepare a final group project to be presented at the end of the session. Full and partial financial assistance is available to students with a demonstrated need who are California residents. The University of Kansas School of Engineering in Lawrence offers a five-day intensive learning camp where ninth through 12th graders receive a hands-on introduction to engineering principles and various career opportunities within the field of engineering. Campers follow a curriculum specific to their individual areas of interest such as computer science, aerospace, mechanical, chemical, civil/architectural, or electrical engineering. Students build their problem-solving skills by working together with fellow campers and faculty to find solutions to real-world engineering design problems. Participants also have the opportunity to visit local engineering facilities to see different types of engineers at work.